Cra Design & Manufactures A Full Range Of Ignition Equipment And Control Systems Including Ignitors And Pilots Such As Flame Front Generators (Ffgs), Electronic, Retractable, Continous & Intermittent Duty Pilots. With Our Significant Experience In The Field And A Large Number Of Successful Installations Globally, Our Systems Are Reliable, Safe And Rugged. We Also Provide Auto-Ignition Systems For Small Waste Gas Applications. CRA designs and manufactures Multi-Fuel Gas Burners for Boiler and Process heater applications that use fuels such as Natural Gas, Propane, Biogas, LPG, Low BTU gases (blast furnace/coke oven gas) in combination with (LFO) light fuel oils (optional). Our burners offer high efficiency due to low excess air and FGR in conjunction with low emissions with guaranteed NOx, CO, VOC and particulate emission rates. With various installations world over, we guarantee a rugged and highly reliable product with advanced part inclusions such as spark ignited pilots and proprietary Burner Management Systems. Our portfolio also includes packaged burners that offer turnkey solutions with all necessary standard equipment such as Fuel Train and BMS pre-installed. These systems are compact, safe, reliable, easy to install and maintain. Mobile Flares are designed and manufactured by Combustion Research Associates for the disposal and flaring of waste & hydrocarbon gases such as natural gas, L.P.G, ethane, biogas and C.B.M for emergency and accidental conditions. Applications include gas pipeline and distribution networks within plants in petrochemical industries, refineries, landfills et cetera. We manufacture mobile flares for the Oil and Gas sector, waste gases and LFG and tank cleaning operations. The mobile flare can be customized to have pressure regulation, metering, KODs, etc. on-board to meet the project requirements. Our highly advanced mobile flares completely follow the API standards, and hence have the capability to handle a wide variety of gases ensuring complete safety. CRA pioneers in the designing and manufacturing of affordable and budget Compact Flares. Our Compact Flares stand out because they are highly efficient and have an integrated structure inclusive of accesories. Compact flares are budget packaged flares that offer capacities upto 60 M3/Hr (approx. 2000 M3/day). Because of their pre-piped, pre-wired and modular construction and design, they can be installed quickly and without hassles. Applications include small waste water treatment plants. RA designs and manufactures an extensive range of Open & Elevated Flaring Systems that offer smokeless and non-smokeless capabilities, high efficiency, safety and reliability. 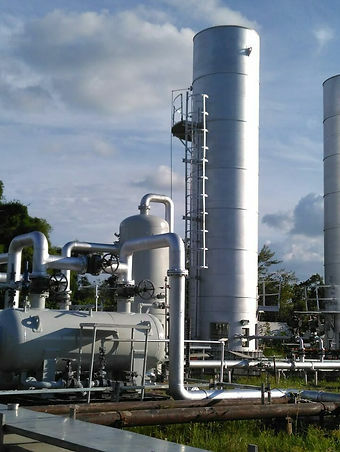 Our engineering prowess allows us to cater to the demands of different industries such as Natural Gas Production and Compression, LNG, Petrochemical, Pharmaceutical, Pulp and Paper, Food processing, Petroleum refining, Chemical Processing and Onshore application. Utility Flares are the simplest and most economical type of flaring systems that work well in applications that don't require smokeless burning or where smokeless burning is attained without assistance from air, steam or gas. Designed to dispose of heavier hydrocarbon gases that have a greater propensity to smoke, Steam Assisted flares use injected steam and mix air into the waste gas combustion zone to provide turbulence and allow for a completely smokeless operation. 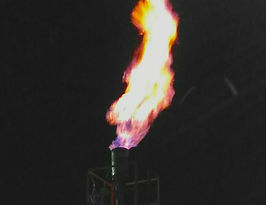 Air Assisted flares use blowers to introduce combustion air into the gas stream as it exits the flare tip. 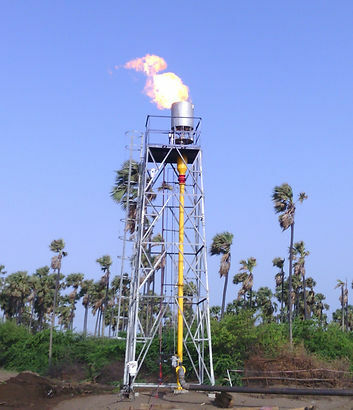 Combustion Research Associates manufactures both Enclosed Ground Flares and Open and Elevated Flare stacks (Candlestick) to dispose off Biogas & Landfill gas. These waste gases generated from Solid and Liquid wastes primarily consist of Methane, Water Vapor, Carbon Dioxide, Hydrogen Sulfide (H2S), NMOCs and other gas emissions. Biogas Flaring systems and Landfill Gas Flares are installed at Landfills, Wastewater facilities, Digesters etc. to dispose of waste gases such as Landfill gas (LFG), Biogas, Syn gas, Producer gas, Sewage gas and Agricultural or Industrial Digester gas that are formed due to the anaerobic decomposition of biomass and organic matter. CRA flares prioritise safety and efficiency, and hence employ special flame arrestors, aspirated burners and high quality pilots. Our flaring systems can be custom designed to meet specific emission values for carbon credit projects etc. Enclosed Flare designed and manufactured by Combustion Research Associates offer smokeless flaring of various pollutants such as Hydrocarbon gases and vapors, Volatile Organic Compounds (VOCs) and Hazardous Air Pollutants (HAPs). With a concealed flare, these stacks pass stringent regulations against visible emissions, vapor radiation, noise pollution etc. A refractory (Ceramic Fiber Insulation) lined combustor stack in our Enclosed flaring systems allows for operation in plants with proximity to crowded areas, processing equipment, environmentally sensitive areas or where the potential of complaints exists from the surrounding community. With over 99% destructive efficiency, our thermal combustors work effectively towards reducing operating costs and emissions. Advantages such as burning at ground level and smokeless and invisible flame make them perfect for gases such as Natural Gas, LPG, Biogas, Landfill gas, Producer Gas, Petrochemical, Syn gas, CBM gas, vapors or any other combustible gases. CRA designs and manufactures pet cremation incineration systems ranging from 10kg to 2000kg load capacity. Our systems can be designed with top loading, side loading or end loading and single or dual loading (single stage or two stage). Animals such as Sheep, Pigs, Fish, Pet cremation, Cattle, Horses etc can be incinerated using fuels such as Diesel, LPG, N-gas or Biofuels. Our incinerators include small machines for crematories that deal with small pets such as hamsters, cats & dogs. We also manufacture twin chamber machines that work well with either large animals or while using the twin chambers. Our larger machines are suitable for mass cremation and large crematories. We completely customize the animal cremation equipment to meet the demands of the client as well as the project, ensuring desirable results whilst maximising efficiency and reducing costs. An additional heat recovery system can be added as an optional add-on further enhancing cost and energy efficiency of the system. Our Brick or Cast internal refractory-lined chambers provide high burn rates and a long machine life. The system can be designed to meet any specific emissions regulation and work in Butcheries, Veterinary Labs, Animal Research Centres, Slaughterhouses and Animal Waste collection. Vapor Combustion Systems designed and manufactured by Combustion Research Associates efficiently destroy harmful emissions such as VOCs and HACs. Used for liquid storage tank operations such as loading of tanks, rail cars, barges, trucks and ships, these enclosed systems are designed to pass the most stringent of emission norms and regulations for NOx, CO et cetera. Similar to Enclosed Flares & Thermal Oxidizers, our systems are completely enclosed, hence ensuring low pollution in terms of noise & air (no smoke or visible flame) and a safe environment around them. We also offer the capability of automated stop-start functionality and our systems can be specifically designed to meet stringent regulations such as Quad O, or any other equivalent. Thermal Oxidizers designed and manufactured by Combustion Research Associates act as emission and pollution control devices to curb industrial pollution in the form of dangerous hydrocarbons such as BTEXs, Sulphur & Volatile Organic Compounds (VOCs) and Hazardous Air Pollutants (HAPs). ​Our Thermal Oxidisers (Incinerators) are capable of achieving very high (over 99%) Hydrocarbon Destruction and Removal Efficiency (DRE). We also offer heat recovery (Optional) Recuperative & Regenerative Thermal Oxidizer (RTO) systems that offer high thermal efficiency, in turn helping achieve low operating costs, energy consumption with fast payback on investments. Systems from CRA use advance technologies for their active control system for effective and efficient functioning and a high turndown due to full automation. 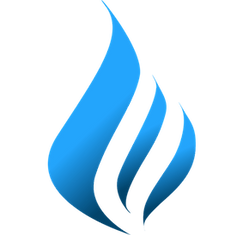 Advantages such as burning at ground level and smokeless and invisible flame make these afterburners perfect for gases such as Natural Gas, LPG, Biogas, Landfill gas, Producer Gas, Petrochemical, Syn gas, CBM gas, vapors or any other combustible gases.